MUMBAIâ€”During his 18-year tenure as chairman of India’s venerable Tata Group, 71-year-old Ratan Tata has led a drive to expand internationally, a strategy India’s other sprawling companies seek to emulate. With annual revenue above $70 billion, Tata Group now derives 65% of its sales outside of India and employs 357,000 people world-wide. It has interests in tea, hotels, cars, steel, chemicals and information technology, among others. Ratan Tata says acquisitions made before the recession will look worthwhile after the economy recovers. But the last two years have been among its rockiest as the company, which was founded in 1868, swallowed two big overseas acquisitions just in time for a global financial crisis. Tata Steel bought Anglo-Dutch steelmaker Corus in 2007 for $12 billion while Tata Motors Ltd. paid $2.3 billion to buy Jaguar and Land Rover from Ford Motor Co. in 2008, two pricey deals that put heat on Mr. Tata, who is a descendant of the conglomerate’s founder. Next week, Mr. Tata will be traveling in the U.S. with Indian Prime Minister Manmohan Singh as part of a business delegation. In an interview, he talks about the value of the Corus and Jaguar acquisitions, company succession plans for when he retires in three years, the conglomerate model and how Indian companies can manage their image in the U.S.
WSJ: Both the Corus and Jaguar Land Rover deals added a lot of debt to the overall company’s picture. Were these purchases worth the financial burden? Mr. Tata:There were many questions raised regarding whether these two large acquisitions â€” Corus and JLR â€” are worthwhile and whether the prices were right in terms of being at the top of the market, virtually. My view on that is that if you want to buy a house and that house is of a particular value, then it may not be there if you wait. On that basis, we bought those two companies. [Corus] gave us presence and scale which it would be difficult to achieve in India over the next eight years. [JLR] gave us international brands which we would have taken many, many years and many billions of dollars to establish in those countries. We have been careful not to try to create a gravy out of this one and sort of merge it with Indian operations. We have brands to nurture and hopefully bring back to their former glory. If we assume that the global meltdown is a phenomenon that will be over in the near term, I think we will look back and say that these are very strategic and worthwhile acquisitions. WSJ: How has the Tata Group managed through the recession? Mr. Tata: The main way has been basically to undertake a major cost-cutting and consolidation exercise. Undoubtedly in some of our companies, it has been large borrowings which we had to overcome. But it has also been some divestment of assets and creating liquidity in the companies. For the most part, we have met the targets we set but for some parts we found that it is not possible because the whole economy has been depressed. WSJ: What would you say that you did particularly well? Mr. Tata:One company standout is Tata Motors. It was particularly badly hit with its acquisition of Jaguar Land Rover, which was in trouble because of the collapse of the auto industry abroad. Tata Motors was able to extinguish its borrowing of $3 billion through this difficult period, and most people don’t realize the magnitude of that task. This was executed very quietly and very successfully. It was achieved by raising new capital and it was achieved by liquidating some of the assets. And it was done by increasing margins by doing away with some loose practices. WSJ: On the flip side, what do you wish you did better? Mr. Tata: You know if one looks back, I don’t know whether we did anything that we undertook badly. I think we’ve been hit by the unfortunate juxtaposition of events. We made two very gutsy overseas acquisitions and, unknown to everybody, including the financial sector, we had this financial sector collapse some months later, which I think aggravated the demand situation, aggravated the liquidity situation, aggravated the working capital situation and led to a set of circumstances that no one could have anticipated. WSJ: What are you doing now to adjust to the economic environment? Mr. Tata: I believe India and the western world are emerging from this recession differently. I think India is recovering, there is a robust recovery, there is liquidity in the market, the banks are in very good shape and the demand situation in India has recovered. To cope with the recovery, we have of course stepped up production to meet the demands that are there. Despite the downturn, we had undertaken fairly ambitious plans of expansion which we are revitalizing. I think in the U.S. there is certainly a flattening out of the freefall and there is a slight recovery. Europe and the U.K. are recovering slower and we will need to see to what extent that recovery is going to be large enough to make a difference. WSJ: How are you conducting the search for your successor and when do you expect a decision to be made? Mr. Tata:We are in the process of formalizing a successor to me. We have some outside consultants and a formal search process is on. There are no constraints. We are looking both within the organization and outside. The successor, I would hope, would have integrity and our value systems in the forefront and hopefully would carry on the path that we have tried to set for the company’s growth. I would hope that there would not be a major disagreement in the way that we have operated. Otherwise, we will have some other disruption in what we do.In terms of who that successor might be, it could be he or she, it could be an internal or an external candidate. It would certainly be easier if that candidate were an Indian national. But now that 65% of our revenues come from overseas, it could also be an expatriate sitting in that position with justification now that we are a company that has global reach and global presence. WSJ: How have you seen the relationship between India and the U.S. developing both on a government-to-government and business-to-business level? Mr. Tata:The relationship between the U.S. and India in particular, I think, has been growing very steadily and at the present moment we have before us a new administration in the U.S. The last administration was very friendly to India. We have every reason to believe that President Obama’s administration will also embrace India as a friend, politically and strategically. On the business front, I think most of us are looking forward to closer business ties with the U.S. Bearing in mind that the U.S. is going through a period of stress in terms of employment, etc. we should be sensitive too. In the current context, it’s very important that Indian companies manage the perception that they have in U.S. I think we have to understand the U.S. business environment; We should not be aggressive and alien to the kind of pain that is happening [in the U.S.]. And we should find ways to be complementary to the needs of U.S. companies and not in fact be a pain to them. I believe we still have the cost advantage which we can use to the benefit of U.S. companies without in fact taking jobs away from them. If we can overcome the difficult period that the U.S. is undergoing, I think we can emerge as a very strong business ally of the U.S.
WSJ: In the years to come, do you feel that Indian companies will be viewed in a particular way or differentiated in a particular way from the global competition? 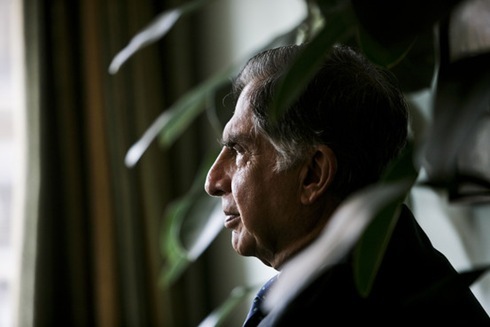 Ratan Tata says Tata Motors has successfully navigated in the recession. Above, Mr. Tata with the Indigo Manza sedan in Mumbai, last month. Mr. Tata: I often wonder how Indian companies will be viewed and perceived world-wide. I think what we have to consider as our advantage is the large skill set that we have in India. Indian companies will need to consider whether they can establish themselves in terms of their presence overseas, and not just view India as the only market. Boundaries are becoming global and barriers are coming down. So while companies overseas visit India, I think Indian companies also need to widen their horizons. It can come from acquisitions, it can come from expansion overseas. This has been in a nascent stage. I think now there needs to be a next stage â€”the consolidation of Indian activity and overseas activities into one merged activity, where management is in fact consolidated in one place. It is still somewhat separated overseas and in India. WSJ: If you could change one thing about the India business environment, what would it be? Mr. Tata:I often feel that we have many policies in place which are fundamentally OK. What we don’t have in India and what makes many of the policies ineffective is that We are very poor in enforcement of [existing] policies. With enforcement I do not mean selective enforcement based on whom you know and how powerful you are but enforcement that applies equally to everyone, whether you are a mere citizen or a powerful politician or industrialist. WSJ: Does the conglomerate model still work for India? Mr. Tata:The conglomerate model has been carried forward from pre-independence days and post-independence days during the protected environment. It has fallen apart elsewhere in the world. The conglomerates in the U.S. were very big and effective at one time but I believe they have all been disbanded. I believe in India, the situation is different. We went through an exercise of trying to focus ourselves into core businesses and shed many less relevant activities that we had and then hit a stone wall, a stone wall of employees objecting who considered themselves as lifetime employees of Tata’s. And the general public was aghast at what we were trying to do. We have slowed down on that because the disruption was quite substantial. We have divested few of the activities as it had a great deal of sensitivity. I believe the conglomerate kind of model has existed to some extent in Japan and of course in Korea and it works well there. I think in the Indian context it will probably continue to work reasonably well. WSJ: How have you seen the perception of your company changing as you have become more global? Mr. Tata: I think as we have gone overseas and looked at global markets, we at the Tata Group have had to change. We had to move from being Indian-centric and being sensitive to what global markets want, to what our target markets want and see how we can meet that. We have a mixed bag. We have products that are marketed in certain countries where we have to be good corporate citizens and promote our brand and we have acquisitions which have had brands of their own and we have had to be sensitive to retain those brands, retain the company’s independence, retain its local nationality, and not be seen storming in and trying to make it an Indian company. So it’s really a question of being accepted in the place where you operate. I think we have been doing that in India with our corporate social responsibility initiative â€” as yet we have done little of that overseas. As we go on, we will see more and more as we go forward. WSJ: Do you think India should position itself as a manufacturing hub that ultimately will rival China? Mr. Tata: I don’t think India would be, or should look at itself as, a country that is going to wipe out China as a source. China is a very formidable force and very efficient source of manufacturing. I think India has great things to learn from China. I think China will change and China will be moving up the value chain more than it has and India will have the opportunity to fill that place. WSJ: How do you feel you have been accepted at Jaguar Land Rover? Mr. Tata: There was a process in which we were selected â€” presumably we had the buy-in of the union and workers. I think we were generally well accepted. The only area I think where we had some explaining to do or clarifying to do was the apprehensions that we would move manufacturing facilities to India and that was easy to put to rest as that was never our intention. Once that was addressed, I must say that from the workforce there was tremendous co-operation. WSJ: What did you learn from your experience in Singur, where plans for the Nano plant were abandoned amid opposition? Mr. Tata: When we went to Singur, where we had a Tata Motors plant, we clearly told them our aim was to industrialize West Bengal. But we had political turmoil which we had not anticipated. Now looking back I can only say that it is very unfortunate but we are better off being away from that scene than being in it, where there is an alien view of industrial development. Unfortunately I think this is spreading beyond West Bengal to the other parts of India where land is required. The government will need to come to terms with finding the acceptable way to fairly and justly monetize the farmer for his land in favor of industrialization or we basically remain an agricultural country where industrialization takes second place. WSJ: How are things going in Gujarat, where the Nano minicar is now being produced? You already had some small issues with the steering column. Are there any other manufacturing problems that have come to light? Mr. Tata: The new plant that we have for the Nano in Gujarat is going very well and we hope it will be operational in January 2010. The issue will be how fast we ramp up to its full capacity but that will not only depend on us but also depend upon our vendors ramping up. We have been very fortunate to move to an environment which has been very positive and very supportive of what we have been doing. There have been little pockets of opportunistic opposition but they have been taken care of by the state government very efficiently. We have delivered orders from interim and temporary locations, I think about 20,000 Nanos so far. We had just one single problem of a particular vendor’s turn-signal indicator that was rubbing against metal where the wire burnt and there was a smoke. We have dealt with that and we have changed the vendor and we have redesigned that part. In fact, we are replacing that in all our cars. WSJ: What is the full capacity you are seeking for the Nano and when? Mr. Tata: Initially 300,000 cars per year going to 500,000 cars. I think we would see ourselves normally in 12-15 months reaching full capacity, if we had everything falling in place. WSJ: How big a brand in India can Jaguar Land Rover be compared to rivals like BMW and Mercedes? Mr. Tata: If we want to compare JLR in India with other established brands like Mercedes or BMW, I think you have to consider apples to apples. JLR would have to be assembled in India like other brands are established in India. India has been an ignored territory for the JLR brand. We have one retail outlet in the country and it is just imports against orders. It will never be the same until we look at another phase where there would be assembly in India which in turn will only depend upon the interest level and the ability of JLR to make that commitment to invest in India. I think JLR should at the present moment continue to just look at importing to India and look at improving and securing its position in the territories in which it is strong.